This ancient South American grain the Incas called “the mother of all grains” has become increasingly popular here in the U.S. since it was introduced in the 1990’s. We first discovered quinoa a couple of years ago when searching for alternatives to wheat for our daughter who is gluten-intolerant, so we are slow getting to the party. It has a pleasant texture, similar to couscous, and unlike some whole grains that seem a little too earthy, quinoa is mildly rice-like and doesn’t compete with other ingredients allowing subtle flavor profiles to come through. Though thought of as a grain, it is technically the fruit or seed of the Goosefoot plant, a member of the same food family as spinach, Swiss chard, and beets. Quinoa is also ground into flour for a bread and pasta products, which we have found to have superior taste and texture to rice pasta. Check out more nutritional information about quinoa here at The World’s Healthiest Foods. Most recipes I have seen recommend a 2:1 ratio of water to quinoa and only a 15 minute cooking time, which nearly turned me off to it entirely. This cooking method was unpredictably soggy at times as well as having an odd crunchy sort of “pop” to the texture that was not appealing to anyone around our table. In my continued search for better quinoa, I found the blog Cooking Quinoa with instructions for “how to cook quinoa perfectly.” Wendy was right; it turns out perfectly fluffy every time with a tender chew more akin to rice or pastas like couscous, which pleased everyone in our family. 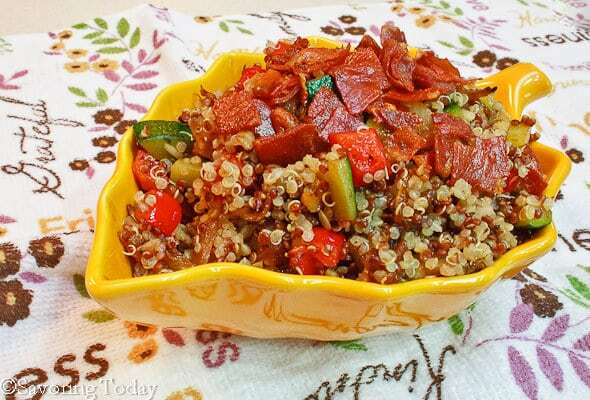 ♦ Naturally coated with saponins, it is important to rinse quinoa before cooking to remove any bitterness. Though some are sold pre-washed and the package will indicate that, it is a good idea to rinse prior to cooking to remove any remaining residue. ♦ In most grocery stores you can find red and golden quinoa, but in some specialty markets you may also find black, orange, pink and purple shades as well. The color does not affect cooking time or texture to any noticeable degree, but pigment may change slightly once cooked. ♦ Quinoa expands almost three times its size when cooked. In this recipe I used both red and golden quinoa to add a confetti effect to the dish, but you can use just one type if you like. Start by preparing the quinoa combo to fluffy perfection and then mix-in caramelized onion and fennel, sautéed zucchini and red bell pepper, and top it off with crisp prosciutto. It is a side dish that goes well with grilled or roasted meats and rewarms beautifully for lunches throughout the week as a meal all its own. Although I think the caramelized onion and fennel are a must here, you can choose any number of other vegetables to toss into the mix—oh, and don’t skip the prosciutto, it lends a salty-savory-studded crunch that takes this dish over the top! Crisp prosciutto, caramelized onion and fennel with sautéed zucchini and red pepper tossed in tender quinoa. A light, complete meal or all-in-one side dish any night of the week. Place quinoa, butter, and water in a sauce pan and bring to a boil. Reduce heat to low, cover and simmer for 30 minutes until the quinoa absorbs all the water in the pan. Remove from heat and keep covered until ready to use. While quinoa is simmering cook prosciutto in a large skillet with a little olive oil over medium heat until crisp. Remove from skillet and drain on a paper towel lined plate and set aside. In the same skillet, add onion and fennel with another tablespoon of olive oil, if needed. Season with salt and pepper and cook over medium-low heat until light golden brown, about 30 minutes. Once onions and fennel are done, remove from skillet and place in the sauce pan on top of the quinoa. Replace lid to keep warm. In the same skillet, sauté zucchini, red pepper, and garlic over medium heat. Season with oregano, thyme, salt and pepper and cook for 6-8 minutes or until vegetables have released liquid and begin to brown in spots. Drizzle with a small amount of oil if needed, but a dry skillet will produce better browning. Once the vegetables are done, toss with quinoa and onions in a large bowl to combine. Sprinkle crisp prosciutto on top to garnish and serve. This dish can be kept warm in an oven and garnished with the prosciutto just before serving. This confetti pilaf is awesome full of goodness. Last week I started cooking quinoa. I love it. Thanks for sharing with Hearth and Soul blog hop. This quinoa pilaf is simply stunning – the prosciutto brings it to a whole other level taste wise ;-). Love all your veggie mix-ins. Wonderful! Love quinoa and the sound of this recipe. I actually have the ingredients and can’t wait to give it a try this weekend. I’ve not tried quinoa yet, Judy but I am halfway there, I bought some. Your salad sounds and looks fantastic and would make a great inaugural dish. Thanks for sharing so much quinoa info. I really had no idea about much of it. Quinoa is good stuff. I don’t use it that much, but I should – it has wonderful flavor and is so healthy. I dislike soggy quinoa too, so thanks for the cooking tips. You are very welcome! We tend to be very picky about textures. Soy fan de la quínoa es un plato saludable y con muchos beneficios aquí en Chile se cosecha bastante,abrazos hugs,hugs. I’m a huge fan of quinoa, I have it almost every day. This looks fantastic. Thanks Jen! We are enjoying it more and more. Thank you, Mary, you too!